European Thai House - Located close to Chaknork Reservoir, this lovely 3 bedroom house is now on the market for sale. 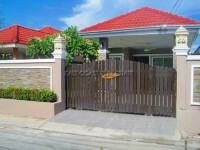 Consisting of up to 254 sqm, the house provides airy rooms and lovely fully furnished materials. The house has 3 bedrooms and 3 bathrooms. The area is great for those who are looking to bring up a family. Having still an easy access to get into the City Centre and Sukhumvit road, you are also far enough away from all the hustle and bustle in such a calm and tranquil site. The title deed is held under Company name. Living area : 254 sqm.